We finally got some snow here in Portland although it only lasted a few hours it was amazingly beautiful for a short while. Growing up in California haven’t much experience with snow and I’m always struck by how still and silent the world seems when it blanketed in all that white. While I was sloshing through all the slush left over from our little storm, I started dreaming about a warm, comforting bowl of soup. Since I’ve been trying to avoid meat, dairy, gluten and sugar, I had to think about my usual bowl of soup a little differently. 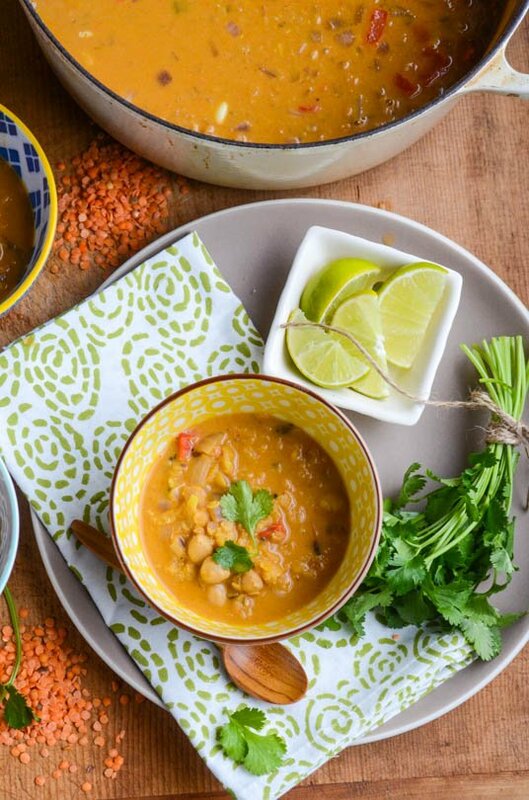 I thought maybe a coconut based soup with some Indian spices, and then I found this recipe for coconut lentil soup from my favorite blogger Heidi Swanson and knew I had to make a version of it. I made a few changes to the recipe based on what I had on hand and my personal preferences, and I couldn’t be happier with the result. 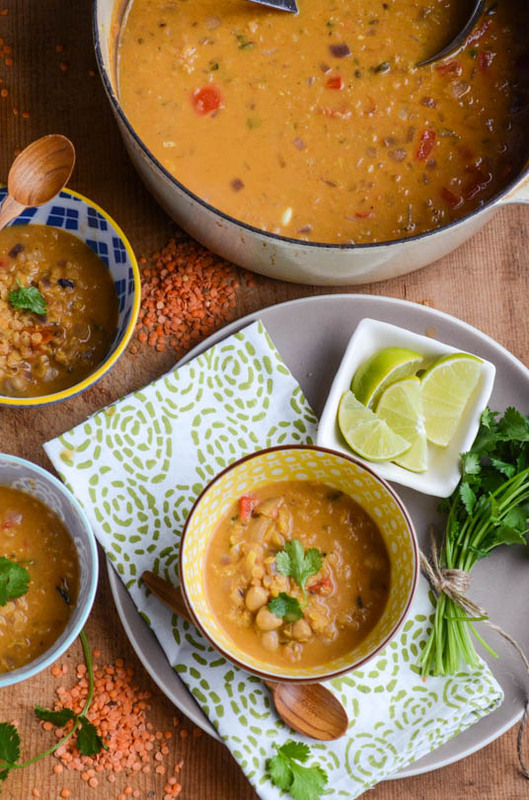 This vegan red lentil coconut soup is perfect on a cold night or when you want something satisfying but light. Lentils are a healthy source of protein, don’t need to be soaked before cooking, and an entire cup of cooked lentils contains just 200 calories. This soup tastes rich and decadent but won’t weigh you down. To bulk it up a little bit more you could serve it with some quinoa or brown rice or maybe a nice spoonful of yogurt. This is a super filling and easy vegan soup that is perfect on a chilly winter night. Heat the tablespoon of olive oil in a dutch oven or large soup pan and add the onions, bell pepper and jalapeno and cook for 5-7 minutes until the vegetables have softened and start to take on some color. Add the garlic, ginger, spices and tomato paste and continue to cook for 2-3 more minutes until the mixture is toasty and fragrant. 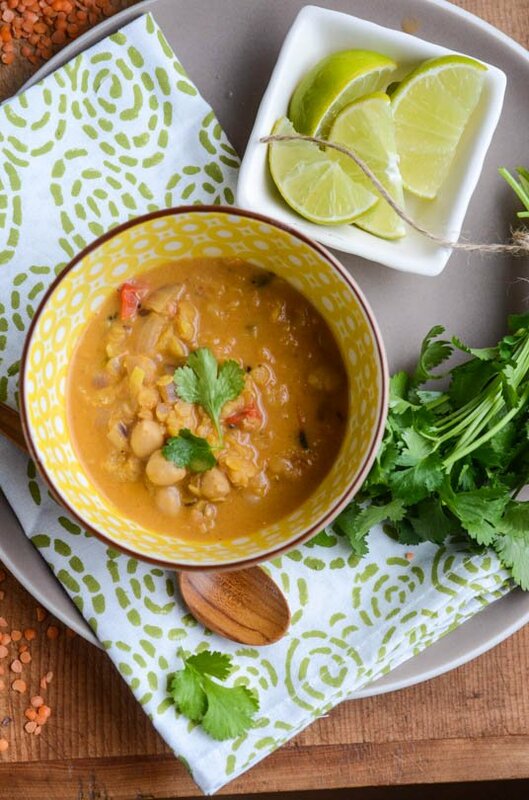 Add the water, coconut milk, lentils and chickpeas, bring the mixture to a boil and then reduce the heat to a simmer and cook uncovered for 20 to 25 minutes adding the lime juice at the end of cooking. Taste and adjust with more salt or more lime juice if desired. Serve the soup topped with a sprinkling of fresh cilantro and some extra limes on the side. This is seriously so awesome! I used a few cups of chicken broth in place of some of the water because I had an open container. So flavorful, and easy to make. YUM! Thanks Molly, I’m glad you enjoyed it! I am all about simplicity when it comes to most of my cooking. It’s nice to have a one pot dish that you can have on the table in 30 minutes. I made this tonight and it was incredible! I especially love how the lentils sort of fall apart and make the soup thick. I sure didn’t feel guilty about having multiple bowls! Found this on Pinterest a few months ago and I have been wanting to make this since then. I made it tonight. It was wonderful!! So glad you enjoyed it! It’s a great recipe to have in the middle of winter! I made this soup for lunch today – it was delish so thanks for posting it. I also added some freshly grated nutmeg on the top at the end after I’d popped a little low fat yoghurt into the soup. Yum, yum, yum. I made this tonight and it was absolutely awesome DELICIOUS!!!! I couldn’t find light unsweetened coconut milk, so used regular. Also, I left the jalapeno out, I don’t like hot spicy. This soup is perfect – the spices are exactly right. I think it was my red lentils, but they cooked a little more than I wanted, but did not affect the soup at all. Will try to correct this in my next pot. We added lots of chopped cilantro and extra lime juice. Is this soup good to freeze? Would you recommend that? This soup is wonderful to freeze. I make a huge batch and freeze half for later. In the winter months I also like to add a few cups of diced butternut squash to the base, it adds a lovely sweetness to the soup. I hope you enjoy it! I also added Butternut squash in tiny dices. It is lovely! I’ve added a little more curry powder & tumeric and it’s perfect. I’m so glad you liked it! I tend to add more spice and sweet potatoes or butternut squash when I make it as well but I toned it down a bit to appeal to more palates. Thanks for trying the recipe! I just made this with a few substitutions based on what I had on hand- a carrot instead of the bell pepper and some quinoa in place of about 3/4 cup of the red lentils. I also used turkey stock in place of water and cut down on the amount of salt. It was amazing! Thanks for the great recipe! I look forward to trying this again with the addition of more veggies, maybe spinach?…. Spinach or kale would be a nice addition. In the winter I like to add a few cups of diced butternut or delicata squash to the mixture to add some extra sweetness and substance. I’m so glad you enjoyed the recipe! I bought a bag of beautiful red lentils at an Indian market. I cannot tell if they are split or not? If I used them in this recipe would it just be a matter of cooking them a bit longer? Most red lentils are splint lentils, you just want to cook them until they soften, since it’s a soup it’s fine to cook them until they fall apart, they just add a lovely texture to the base. Happy cooking and thanks for trying the recipe! I just finished making this soup and it is very easy to make and very tastefull! Thanks for sharing! Sounds wonderful! I’m thinking I could use kaffir lime leaves instead of lime juice perhaps? Absolutely, if you have access to kaffir lime leaves add it to the mixture before you add the stock. I hope you enjoy the recipe if you give it a try! Made this last night…really simple and good. Used half chicken stock and half water. Kids and husband loved it too! I grated fresh jalepnos directly into the adult bowls so the whole family could eat the soup. Worked great. …zested…not grated…it was like pepper puree. My husband loves spicy as well so I usually add a little more chili paste and sometimes I garnish it with a mixture of jalapeno, cilantro, garlic and olive oil. Delicious! I love this recipe! I made it several times and every time it tastes amazing! Great to hear that the recipe worked for you, I love that it’s a one bowl dish and that it tastes better the longer it sits so it always stays in my rotation of healthy, quick meals! Is it okay to use french lentils? or is it just red lentils? You could try it with french lentils but it if you can find yellow split peas they would make a better substitution. Could I use ginger paste in lieu of the fresh ginger? If so, how much should I use? Hi Rachel,You can definitely use ginger paste instead of fresh, I would suggest trying a teaspoon in place of the fresh. Enjoy! What an amazing, simple, and delicious soup! Perfect for weekday meals. Thank you so much! Depending on the serving size, you should get a generous 6-8 servings out of this recipe. I just made this soup and it really is fantastic! I am the only vegetarian in my house and now have a huge pot…how long would you say this soup will keep in the fridge? You should be able to keep the soup in the fridge for 4-5 days. It also freezes really well so I portion it out in small containers and freeze it for up to 3 months. If you wanted to serve it to someone that isn’t a vegetarian some sauteed shrimp or rotisserie chicken makes a great addition. Thanks for trying the recipe! Hi, I’ve made 2 pots of this soup this week….ate one all by myself and shared the other with a group of ladies last night. I’m notorious for not following recipes, but pretty much followed yours as it made since (flavor combinations I often use). But then at the last minute I tasted it and felt it needed something so I opened my fridge and saw a bottle of peach chutney. I stirred in about 3 T and loved the little flavor kick it gave the soup. Last night people kept asking what the secret ingredient was. I also tried once this week, and loved it, to top the soup with chopped fresh tomatoes & fried onions as well as the cilantro. Thanks for a good recipe! How many people does this soup serve? Looks delicious! You should get 6-8 generous servings from this recipe. Thanks for checking it out! This recipe looks great & I love the substitutions and suggestions in the comments (I’ll probably add some kale). I couldn’t find red lentils at the store yesterday, but I already have some Regular Lentils and some Petite French Green Lentils. Neither are split. Are these acceptable substitutes? Should I make any adjustments? Soak them? Cook them longer? I’m relatively new to lentils & I don’t like crunchy/uncooked lentils in my soups. Trader Joe’s has red lentils! Wow! A friend pinned this and I just decided to make it this afternoon. It is so delicious! I didn’t have a few things so I subbed and it still came out great–diced tomato for the paste. Frozen bell pepper mix for the red pepper, red pepper flakes for the jalapenos, only had 1/2 can of coconut milk left so I added that and some frozen coconut that I had. Thanks so much for this addition to me go-to easy meals! This is one of my personal favorite recipes, it’s pretty simple but it’s delicious hot or cold. I’m so glad you liked it! Making this for the second time today, it was so delicious the first time my bf kept asking me when I,ll be making this again. I didn’t have tomato paste last time so used red curry paste and it was lovely and chilli. Such a winner! Yum! I have been making it lately with red curry paste, I agree it adds a great depth of flavor to the soup. So glad you enjoyed it! This is great! Such an easy recipe and tastes amazing. Found this floating around facebook and can’t wait to try it. I have so many friends this would be perfect for. Yummy! So looking forward to trying this recipe!!! Found this on pintrest. . . What a Wonderful recipe. I used brown regular lentils. Could not find the red. They didn’t soften up as much as I would have liked just simmering in the soup so next time I will pre-cook them a bit before adding them. Also added about a cup of cooked quinoa that I had extra from another recipe I was making. Served it with garlic Naan bread. Yummy. Thank you. I will be making this often! Sorry if this is a dumb question; I’ve never used lentils before. 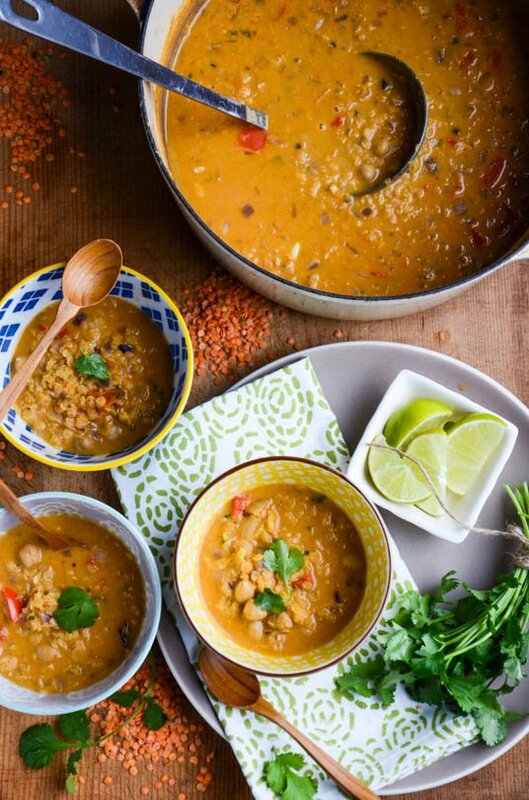 Do I need to cook the lentils separately before adding them into the soup pot, or can I throw them in dry and they’ll cook during the 20-25 minutes? I’m so excited to try this recipe! Thanks for sharing! Lentils are the easiest legume to prepare, no soaking or pre-cooking required. Just add them to the pot and give them about 15-20 minutes and they’ll be ready to eat! I am pretty sure the lentils i used were just regular lentils- not red- but this soup was STILL SO AMAZING. I want to send you a fruit basket or something. any idea the nutritional info? wow, this is the blandest soup I’ve every tried and I used less water than it called for and was throwing every spice I had at it to give it some flavor. Sorry you didn’t enjoy the recipe. Did you toast the spices before you added the water and coconut milk? It helps to bring out and develop the flavors, I have also made it using thai chili paste instead of the curry powder and it ups the heat and flavor. One of the first Pinterest recipes I’ve actually tried after pinning. So good! I’m part of a meal share with a few other families, and this was a hit. I followed the recipe very closely, except that I omitted the jalapeno (erred on the side of caution with regard to heat) and added matchstick carrots. Amazing flavor, easy to prepare. Thanks for trying the recipe Lindsay, I’m so glad you enjoyed it! Great recipe. My entire family, including 2 kids, loved it. Used lemon instead of lime, because that is what i had on hand. I love that it is fairly economical to make as well – right up my alley! I’m excited to make this this week! What are your thoughts about using a crock pot with this recipe? Would it still be as good? I thought I’d reply to my own post in case anyone else wanted to crock pot it. Threw all of the ingredients in a crock pot (didn’t sauté the onions ahead of time, etc.) and cooked on low for about 10 hours. It was too watery but still really good. I saw on a site about converting recipes for a crock pot that I should have reduced the water by about half. I’ll do that next time. It still turned out great and will definitely be added to our rotation of meals!! I’m having family over on Sunday night and some of them are not eating meat during lent. This looks like a great dish to make for them. I was thinking of making this ahead of time (Saturday) and reheating before they arrive Sunday, will that be ok? I have a bunch of chickpeas soaking as we speak…so I’m going to make this soup this weekend–it looks so delicious! Made this wend night OMG!! Amazing I just used veg broth instead of all the water but wow the taste is great I’m making another pot as I comment thanks a bunch for this recipe my tummy appreciates it!! You can omit the chickpeas or substitute any other bean you like. Thank you for this fantastic recipe! I made it for the first time for Easter dinner (risky) and it was a big success. Not only healthy and delicious but so easy! I’m no longer intimidated by soup making. I revamped the leftovers by adding grilled chicken, quinoa (as you suggested), and spinach, and it made a whole new yummy meal. Tina! I was so impressed with the COLORS of this recipe, and then the TASTE was equally amazing. This was a great way to introduce lentils to my boyfriend without scarring him away with something super healthy for dinner. Thanks again! and will be back for sure. Thank you so much for this lovely recipe. My mum has made me forward this on to so many people since I shared some with her. Have a cold and wanted to use red lentils and make something a bit spicey. I found this and wow, how easy to make, great photos and description. I used veggie broth too, and carrots and zuke. This really knocked my socks off. So tasty and flavorful and really easy. Thank you! reallu such a GOOD soup…I was reading the recipe and realized I have all ingredients at home, so made some and I am in HEAVEN! Was wondering if you have used the coconut milk from the carton or just the can? Just curious if there was a difference. One of the best soups ever! Thank you so much for sharing the recipe. Thanks Bee! I don’t know how I’ll ever top this recipe but I find myself making this one again and again. This soup was so amazing! Thank you so much for sharing. I almost finished the whole pot by myself. We loved this!!! Made it last night exactly as written and enjoyed with rice. I’m so glad you enjoyed the recipe. I love to make it when the weather starts to cool off! This is the best! I didn’t have all the ingredients and it still came out amazing. I used kale, sweet potatoes and a mix of lentils and quinoa. This is by far the best soup I’ve ever had. Can’t say enough good things about it! I made this tonight and loved it, AND my 2-year-old ate a decent amount (and she eats almost nothing). I did find that the spices did not taste as intense as they smelled…I added more of all of them and plenty of lime. The lime really highlights all of the other flavors. Thanks! How many ounces of the coconut milk? I have a bigger container, not just a can. I used a 14-ounce can of coconut milk or around 2 cups in the recipe but if you’d like it to be richer feel free to use more. Can someone tell me how many Weight Watchers plus points this recipe would be per serving? Absolutely loved this! Made a few substitutions based on the comments and it turned out great – will be making again for bible study. – chicken bouillon to flavor up the water. We are in the midst of an ice storm, after several days of snow. The kids have had school cancelled since before Christmas. We are working on projects around the house, have the pellet stove cranking, and this soup is in the crock pot. I don’t have all of the ingredients (not going out in the ice and snow), but I have coconut milk, so it will have a flavor different from lentil soups I have made in the past. Looking forward to it. I found your recipe over a year ago, and it has since become my favorite go to soup! I love the flavors and simplicity of it. Thank you for sharing it with us! I make it at least once a month and eat the leftovers for days without getting bored. It smells and tastes great! Thanks Rachel! I am so glad that you enjoy the recipe, it’s a soup that I make frequently in the winter months and I always have the ingredients in my pantry! I found this soup on Pinterest and made it last night. My husband and I loved it. As I don’t handle spicy foods well, I just didn’t include the jalapeno SEEDS. It turned out great and flavorful, not hot ‘spicy’ at all. I looked at the original 101 Cookbooks recipe today and i’m curious about why you made some of the changes you did, like leaving out the raisins. Either way, I love this recipe. Thanks! The changes I made were to suit my families taste. If I served a soup with raisins in it to my husband he wouldn’t have taken a bite. I added the garbanzo beans for a little more bulk and added the cinnamon and lime to enhance the flavor. Thanks for trying it out! I have never left a comment on a food blog in my life but had to for this recipe. It. Was. Amazing. The only substitutions were: I didn’t have a jalepeno pepper so I tossed in some chili flakes and I didn’t have any cilantro so threw in some spinach whose time had come. It was most gratifying to see my kid inhaling a bowl on the couch while watching a movie uttering “Zomg, mom, this is sooooo goooood”. And it only took 30 minutes from start to finish. I’m so glad that you enjoyed the recipe. I have some very picky eaters and it’s always exciting to find something that we can all eat and enjoy together. This soup is one of those dishes! You should be able to serve 6 easily with the recipe. Let me know how you like it if you do try it! Enjoying a bowl right now…I added a sweet potato and kale and it is amazing! Great recipe and will definitely make again for anyone and everyone! I’m so glad that you enjoyed it! I love adding sweet potatoes or butternut squash to the soup, it adds a nice sweetness to it! I just made this and it is wonderful!!!!!!! I added some shredded chicken breast to boost the protein for my bf and subbed a quart of chicken broth for some of the water for extra depth and richness. Fab fab FAB recipe!! Thanks for sharing! This has to be my favorite soup/meal ever! I have been GF since 1994…for me to eat something really good, I usually have to make it myself…and cooking gets tiring…but this was easy and so delicious! We added more of the thai curry paste and some cayenne pepper to make it spicier…JUST LOVE and LOVE your blog! also, used veg broth cuz I had it on hand. I’m so glad you liked the recipe. I tend to add more spice to my version as well but I know that we like it hot so I toned it down a bit when I wrote the recipe. Thank you so much for reading the blog and the kind words! I followed the directions but it was missing something. After adding a lot more red curry paste and curry powder (I know it said one or the other), & fish sauce, it finally was delish! The family loved it! Next time I will try it with vegetable broth. Did you toast the spices and curry paste before you added the water? I usually use a bit more curry paste when I make the soup but I like things a little spicier than most. I also think that the lime is really important to bring all the flavors together. Using full fat coconut milk and vegetable stock will really boost the flavor if you want more punch. I made this recipe just as directed. It was simply delicious. It has become one of my main staples. Everyone in my family loves it. I absolutely love it. Thank you! I am a new fan! I’m so glad that you enjoyed the soup. It’s one of our favorite soups when we are looking for something easy and quick for dinner and I usually have all the ingredients hanging out in my pantry. 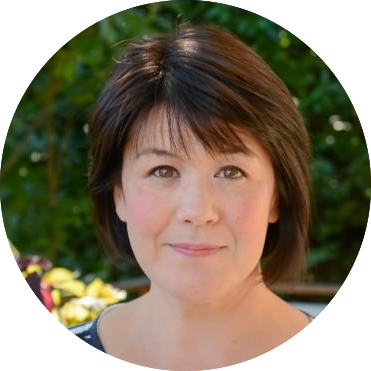 Thanks for reading the blog and I hope you find a few more recipes that you like! Just made this soup tonight. We loved it, but I added Lemon Grass and more lime juice. We also added Siracha, because we like spice. I will make it again for sure. I’m so glad you enjoyed it. I love sriracha too and I’m sure it makes a great addition to the soup! Found this on pinterest and made it tonight. It’s delicious. Thanks for sharing! I found this recipe on pinterest and served it as soup of the day in my cafe this week and received rave reviews from customers and other members of staff. Thank you for sharing. Thank you so much Lisa. I’m so excited to hear that you served my recipe in your cafe and that everyone enjoyed it, I’m honored. The lentils are not pre-cooked and the chickpeas are canned so they are pre-cooked. Red lentils cook really quickly, usually 15 minutes or so. I hope you like it if you try the recipe! 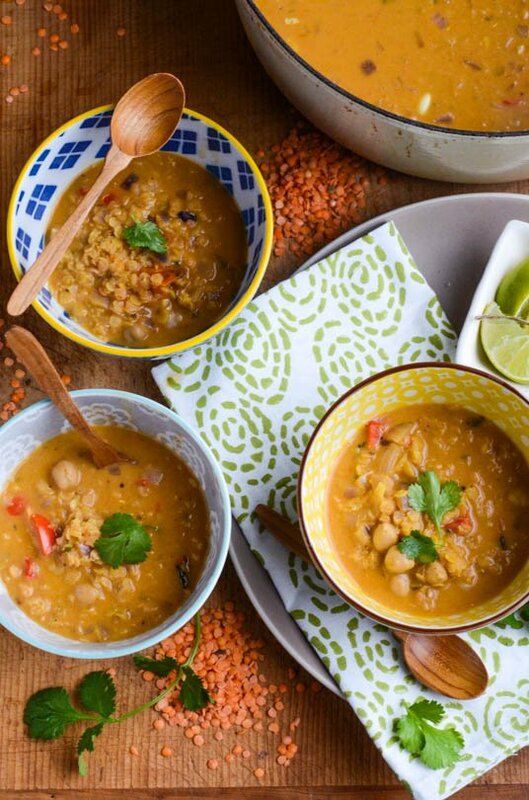 Are you adding cooked lentils or do they just cook in the coconut milk for 25 minutes? On a simmer or do we boil? You are adding dry uncooked lentils to the soup. Bring the mixture to a boil and then reduce to a simmer for 25 minutes. Hope that clarifies things for you. I hope you enjoy the recipe if you try it! Thanks Caroline, I’m so glad you enjoyed it. I love the fact that you can make it with staples you can find in your pantry! We have been making your recipe now for years…total staple in our house especially in fall and winter. Wish it had the nutritional information attached but nevertheless – wonderful wonderful recipe. I’m so glad that you enjoy the recipe, it’s a Fall favorite in our house. I don’t usually include the nutritional information for my recipes because I find I obsess about calories too much and have found over the years that it’s much wiser for me to just eat intuitively and watch my portion sizes. Thanks again for the kind words! Can This soup be frozen ? This soup freezes beautifully, it should be fine in the freezer for up to 3 months. Just leave out the yogurt until you are ready to serve it. I hope you enjoy it if you give the recipe a try! This recipe is fantastic! I made it today for lunch and was so happy with the result. I tore up some fresh spinach and added it to my bowl which added some excellent colour and texture. I also love that it’s vegan! It made enough for about 6 large servings, 5 of which I plan on freezing. Thank you so much for sharing this delicious recipe…it’s going straight into my ‘keepers’ folder! Thank you so much! I’m glad you enjoyed the recipe. It’s one of my favorites and so easy to throw together with things from the pantry. I wish cooking was always this simple! I can’t wait to try this recipe! Must the chickpeas be drained before adding, or does the aquafaba go into the soup as well? Thank you! You should drain the chickpeas before adding them to the soup. The lentils add a lot of creaminess so you don’t need the extra starch. I hope you like the recipe if you give it a try! I’m so glad you enjoyed the recipe! I use a red curry paste for this recipe and in a pinch I’ve used curry powder but it imparts a very different final product. Thanks again for trying the recipe! Seriously amazing soup. I used a stick blender to thicken and create a smoothness. Paired with a salad of pea shoots, cara cara oranges and avocado – we were in heaven!! I’m so glad you enjoyed the recipe. That salad sounds amazing, I love pea shoots! That’s a combination I need to try! This is a fantastic soup! I prefer the chili paste to the powder but either way it’s great and very filling. I totally agree, but I know that most people have some curry powder hiding in the back of their spice cabinet and it works well enough. I always make it with a Thai spiced curry paste myself. I’m so glad you enjoyed the recipe! Such a flavorful and satisfying recipe, I gave some to a friend who put it in a blender and poured it over rice and shrimp she said it was delicious as a sauce and would try it with other dishes. It’s great to have on hand for those busy days when I don’t have time to cook but want to eat healthy so I always keep some in the freezer.